One of the many beautiful things about New York City is that the weekend never actually begins on Friday, it is a lot like college, the weekend's begin on Thursday. 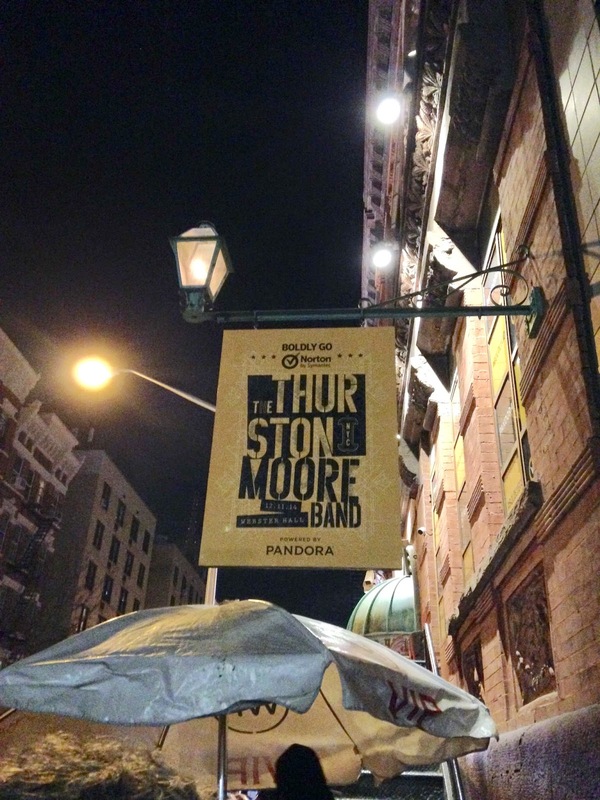 So, when Pandora and Norton decided to throw a party inside the tiny Marlin Room of Webster Hall and had Thurston Moore and his band perform, it should come as no surprise that there was a line wrapped around the block for people waiting to get in. As December and winter barrel down on New York, it is a hard obstacle to get people to go out, but when you promise open bar and chance to see an iconic New York artist inside an intimate room of one of New York's most iconic venues, and do it on a Thursday, that is called smart planning. As fans crammed in and tried to thaw, just after 9pm, Moore and his new band hit the stage. Plucking away at their instruments and creating a sound that made you feel like Matthew McConaughey's character in Interstellar floating in outer space, you have to wonder what Moore and his band, dubbed "The Thurston Moore Band," would do next. Nevertheless, as you tried to adjust to his new sound, he brought you back to his world with rabid distortion, thunderous rhythms, and most of all, that indie rock flair that he has had for four decades. Moving on stage as if he was still 20 years old, it is almost as if Moore never aged, his songwriting has stayed the same, his musicianship is still as uncomfortable as ever, but his zest for performing is still there, even for an old punk playing a corporate event. "We are who they say we are," Moore told the crowd before introducing his members, and before jumping into "Detonation," a song he wrote for Chelsea Manning and who he preached to be a hero, it was clear that no matter the circumstances, he was still going to be himself, which is what you love about him. As he and the band performing songs from his solo records, a majority of the former Sonic Youth frontman's set came from their latest album, The Best Day. As fans, new and old, got a chance to see and hear one of their heroes inside a personal setting, it is something that will always be remembered.